Street Address: No.100, Wuquan S. Rd., South Dist., Taichung City, Taiwan. The National Library of Public Information was established on 1923, and it has been relocated and renamed three times. The main purpose of the library is to serve everyone, and the library provides a diverse service to suit all age group’s need. The library now embraces the digital era, combines virtual and physical spaces and resources, and provides service with an innovated way. The library moved to the new building on 3rd of June 2012, and changes the name on the 1st of January to 「The National Library of Public Information」. The NLPI is now a national library that can be enjoyed by the public on both physical and virtual environment. They can read, discover, relax, and achieve lifelong learning under the care of NLPI. The genesis of the design is the decision to directly confront the challenges and opportunities presented by the dynamic nature of digital media. Inspirations for the massing concept include the Mobius strip and Klein bottle, both of which explore solid and void, form and formless. In the interior, each floor’s spatial arrangement, color and furniture design takes its cue from the corresponding outside view – event, trunk, crown, the city skyline, and cloud. 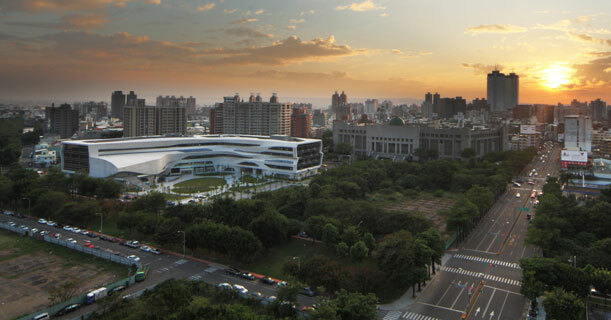 The result is clear differentiation of the various program areas while the building’s abundant glazing fosters an outside-in effect. 1F Digital Lobby: Designed as a space to feature the flow of information, the use of orange-red color symbolizes the energy of the crowd with the information desk as the focus. The children learning area employs a forest and animal theme with colorful elements such as bookshelves that recall hedges to create a spatial experience. 3F Periodicals: The tree crowns are transformed into bookshelves and furniture for reading, creating an atmosphere of being in the treetop. 4F Science and Technology: Taking its cue from the urban skyline, the bookshelves are staggered in height and feature brightly painted, lighting integrated display frames that evoke city lights through windows. 5F Humanities: The cloud-like curved white furniture echoes the blue sky above and is enhanced by the natural light filtered through the round skylights. 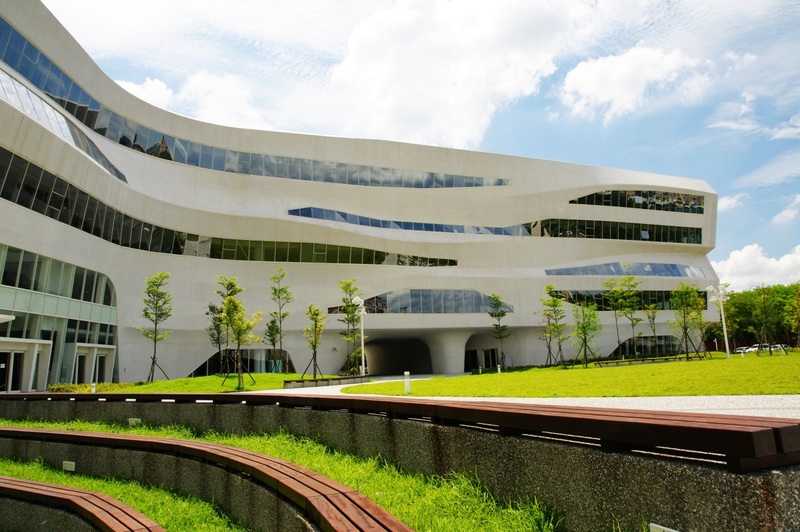 The building’s free-formed skin with its curved planes and organic tree trunk-shaped columns tested the limits of design and construction in Taiwan. Starting with the structural slanted columns and slab edges, then a series of zigzagging curtain wall sub-frames that approximates the final undulating surface, the skin’s design was conceived from the inside-out. Finally, a composite wall system with integrated EPS insulation that molds to the folding surfaces, which are then cladded with pearl-white round mosaic tiles of eight different sizes enabling the skin to achieve a monocoque appearance. Throughout the process, advanced 3D design software and several on-site mock-ups were utilized. Specific examples of sustainable features include the curved exterior light-weight composite wall system with integrated insulation. The skylight and inclining windows in the reading area introduce natural light into the reading area effectively. The underground public reading room and the recessed volumes of the ground floor facilitate natural air convection. The Innovated Facilities include Digital Experience Areas, Digital Leisure Center, Multi-Cultural Services, augmented reality（AR）for children reading, lucky books interactive passageway, interactive story room, RFID automatic book sorting system and colored book labels, book-carrying robot – Bopi, Smart Book Shelf Window ,etc. In Incorporating eReading@your library Program with e-Book Online Service, and Digital Resource Promotion Service, NLPI has been cooperating with different sectors/fields to help citizens in 24 remote and disadvantaged villages/towns to free use of technology and the Internet to engage in e-reading and life-long learning and the achievement of the project has been identified and highly appreciated. As a result, NLPI is planning to replicate the service mode of the project and expand the services to sustain this service in the future.